“Rick and Morty” is everything you could want from a show and more: It is original, adventurous, and over-the-top hilarious. The focal points of the series are the two title characters, Rick Sanchez and Morty Smith. Rick’s grandson, Morty, is more or less a guinea pig for Rick’s scientific “studies.” Together, the two of them go on glaringly dangerous adventures; and of course, comedy gold ensues. Sounds simple enough, right? Actually, the show can get rather complex at times. Rick and Morty might be the stars, but there’s a plethora of secondary characters and complicated plot lines to keep things feeling fresh. These subordinate personalities even have a tendency to steal the spotlight despite getting such little time to shine. Characters like Mr. Meseeks, Squanchy, and Scary Terry have become fixtures for the franchise thanks to fan admiration. One thing that sets “Rick and Morty” ahead of the pack is its ability to bend genres with ease. The animated sitcom incorporates elements of science fiction, comedy, action, satire, and drama to keep viewers engaged episode-to-episode. You never know what to expect from the show, and that’s the beauty of it. Co-creators Dan Harmon and Justin Roiland refuse to shy away from any subject matter, even on the darker side of things. Some episodes seamlessly transition from hysterical to depressing, all in a matter of a few scenes. These “depressing” moments are some of the show’s most captivating scenes where Rick and Morty’s genius truly begins to shine. 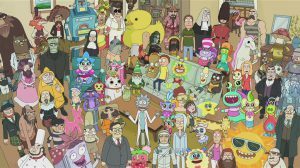 The show is in the midst of its third season, and is available on Cartoon Network’s Adult Swim. New episodes typically air on Sunday nights at 11:30 PM, but be warned: “Rick and Morty” isn’t known for having the most consistent release schedule. Checking your T.V. guide ahead of time is well-advised.